A friend of mine’s baby just crossed that threshold from sweet smelling breastfed diapers to the offensive food eating bowel movements. Diaper changes are now done in a hurry, especially when other people are around, and the baby has joined the ranks of the rest of the family that can stink up a room. 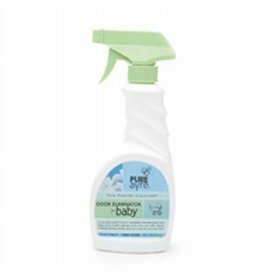 PureAyre makes several organic odor eliminating sprays that really do work for the smells babies, kids, and adults produce in the bathroom. In our family of four, we have only one bathroom. Sometimes in the mornings, we can’t wait for the air to clear before another family member needs to brush their teeth before school. We keep a bottle of PureAyre on the back of the toilet, and it really does works to eliminate odors without masking them. I don’t really understand how it works, but the strong smells just seem to disappear. I’ve tried lavender bunches, matches, scented candles, etc., but nothing compares to PureAyre’s ability to eliminate odor. With the rise of asthma, chemical sensitivities and respiratory illnesses in the U.S., air quality has become a critical issue, but most Americans don’t realize that the fabric, carpet, pet, and air “fresheners” commonly found on grocery store shelves often add to the problem because they use non-natural, chemical ingredients. Even worse, most are delivered using ozone-depleting propellants in an aerosol spray. For people, pets, and babies with a developing immune system and lots of indoor time, this can be bad for everyone’s health. “Most air fresheners don’t even list their ingredients,” says James Mitchell, founder of Clean Earth, maker of PureAyre, “but when you find out what’s in them, and what those ingredients can do – some of them even known carcinogens – you will be appalled to think that you’ve been spraying the stuff around your home and your children. It’s not natural and it’s not good for you. This kind of introduction of foreign substances into our indoor air is a very unhealthy practice.” The irony is that most of the time, sprays are used to create the illusion of cleanliness and freshness. PureAyre is made from plant-derived enzymes that break the chemical bonds of odor-causing substances, destroying the source (the odoriferous molecules). PureAyre is the natural way to eliminate odors, and it is is safe to use in food preparation areas and around babies. It can also be used to remove stains. well is this perfect diapers? sure?